Google has unveiled a number of new search options, which it hopes will give users a "different way to look at the web." The veritable feast of forthcoming features and products, include tools to improve mobile phone functionality and a search that will only look through the prior 24 hours. Revealed at its Searchology event, which the company held at its Mountain View headquarters, the new features include an option called Google Squared. Essentially, Google Squared adds depth to search results in the form of a spreadsheet. 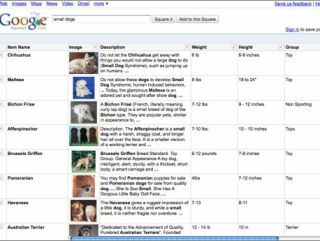 The example given was if you type 'small dogs' into Google Squared, you won't just get results centred round the topic 'small dogs' but a whole heap of facts and figures, like weight, life expectancy and breeder details. Google's Marissa Mayer explained at the event: "The race in search is far from over and innovation and continued improvement is absolutely pivotal." Referring to Google Squared, she said: "I think we can open the kimono a little bit without talking about the computer science behind it. "This is all in the secret sauce of what we are doing and it takes an incredible amount of compute power to create those squares." Another new feature is Google Search Options. The new Options give users more control of what information they receive. Here, you can create your own search profiles by refining and filtering like never before. Once you have searched for something, new options will appear to help you dig a little deeper into the subject, through blogs, video, reviews, timelines etc. This is something that will appear as part of the search engine within the coming week, and is being heralded by Google's product manager Kavi Goel as a "step toward making the whole internet smarter." One feature that is available immediately is the capacity to only search for topics in the last 24 hours, bringing up the most fresh news and blog posts. This is part of the enhanced Google Search Options that also include the 'Wonder Wheel' which puts the keyword at the centre with other keywords surrounding it. Last but certainly not least comes Sky Map - an official Google app for Android that 'allows users to more easily learn about the night sky'.